■ Identify places where life is found on Earth. ■ Observe how the environment influences life. All living things on Earth depend on each other for survival. What makes Earth different from other planets in the solar system? One difference is Earth's abundance of living organisms. The part of Earth that supports life is the biosphere (BI uh sfihr). The biosphere includes the top portion of Earth's crust, all the waters that cover Earth's surface, and the atmosphere that surrounds Earth. What three things make up the biosphere? 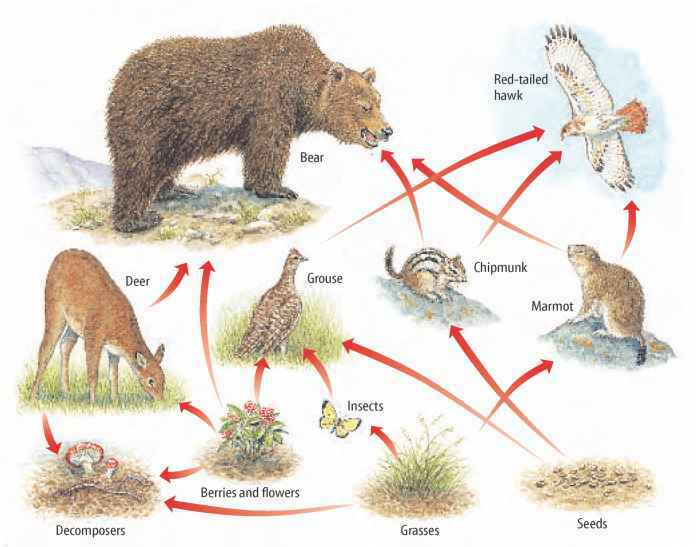 As Figure 1 shows, the biosphere is made up of different environments that are home to different kinds of organisms. For example, desert environments receive little rain. Cactus plants, coyotes, and lizards are included in the life of the desert. Tropical rain forest environments receive plenty of rain and warm weather. Parrots, monkeys, and tens of thousands of other organisms live in the rain forest. Coral reefs form in warm, shallow ocean waters. Arctic regions near the north pole are covered with ice and snow. Polar bears, seals, and walruses live in the arctic. Figure 1 Earth's biosphere consists of many environments, including ocean waters, polar regions, and deserts.